What is the very first thing that comes to your mind when you saw this bag? Honestly, I thought of the movie Pocahontas. I know that the bohemian chic look is one that seems to be all over the place. Now, don’t get me wrong, I love the bohemian look as much as the next person, I just don’t know if I could pull of this Jimmy Choo Savannah Pouch Bag. Well, now that I think about it a bit more, this bag looks a little more folk than bohemian. Of course, in typical Jimmy Choo fashion, the bag is made with great quality. 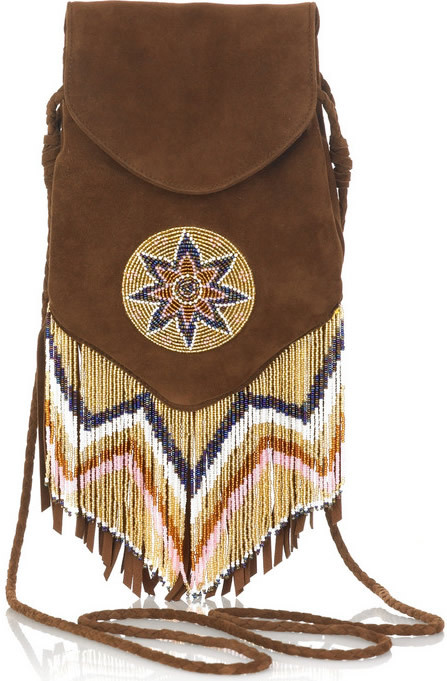 The tan suede pouch clearly has fringing, which is all everywhere this fall as well as beaded embroidery. Although the fold over top might look like it just hangs, the flap actually as a magnetic closure, which is a huge plus. Lined with suede and lilac trim, clearly, the bag was well thought about from start to finish. But, at the end of the day, if I am going to buy an expensive handbag like this one, I need to make myself feel better by figuring out a way to justify the purchase at least a little bit. I don’t really know where I would wear this nor which outfit would compliment it. I am sure there are plenty of you out there who can pull it off, but I don’t think I am a part of that group. What do you think? Is this bag worth the price? Buy through Net-a-Porter for $1,650.